New innovative shelving design comfortably accommodates every size bottle in your collection. Smart spacing between shelves ensures easy access and proper protection for your bottles and labels. Soft white LEDs safely illuminates your bottles, showcasing your wine in style. Charcoal filter (included) maintains proper humidity and ensures that fresh air circulates throughout the cabinet. Place in any room in your home freestanding or built into cabinetry. The innovative technology keeps noise to a minimum while also ensuring exact performance, energy efficiency and quiet operation. Charcoal filter (included) ensures that fresh air circulates throughout the cabinet and assists in maintaining proper humidity. Saves money by reducing energy consumption without sacrificing performance. Mon, Apr 29 - Thu, May 9. With Door-to-Door Delivery, we deliver your item to your first enclosure (front door, porch, basement, garage). Stairs are not included with Door to Door delivery, if there are stairs to reach your first enclosure there will be an additional delivery fee assessed. You will be notified by phone of the delivery date and time. Delivery past the first enclosure and/or up or down stairs inside your home are not included, that would be considered White Glove Delivery. If you'd like to arrange a Saturday delivery, schedule a specific delivery date, or request White Glove Delivery, feel free to call our Wine Cellar Specialists at 800.377.3330. Door-To-Door delivery rates apply for orders shipped to the contiguous 48 US states. For orders to Alaska, Hawaii, Puerto Rico, APO/FPO, or islands off the US (i.e. Martha's Vineyard, Kiawah Island, etc.) addresses please call 914.345.9463 for current rates. Sorry, we cannot ship items to a P.O. box. Where is this unit made? Does the door open flush with the side or does it open wider than the 23.75 width? Thank you! Do the shelves hold champagne bottles easily? BEST ANSWER: Although I have not loaded any champagne bottles in our current model, I know that the previous one held champagne bottles. It was a bit tight though, but did hold them. I know that shelves can be removed which would allow for larger bottles if you want plenty of room and no risk of scratching the labels. I've been able to load champagne on the 2nd shelf...seems to have a little more room that the very top shelf. I wouldn’t say easily and will impact your total storage. What are the sides and top clad in? We would want to use it free-standing, so this is an important consideration. BEST ANSWER: Mine is freestanding. Looks very nice. Top and sides are black painted metal. Thank you for taking the time to answer my questionEnter a reply to Philip J. Bottom rack not full depth? Can't put a full-size bottle on the bottom rack...something in the bottom back is in the say...and the rack itself isn't full depth. BEST ANSWER: The bottom shelf works for a “regular” red wine bottle, but not for extra tall such as Riesling’s. Since I store only red wines in the bottom shelves it has not been a problem. Correct, ours is the same way, we put our Pinot bottoms in the bottom since they are a little shorter. BEST ANSWER: Miriam, the dimensions of this cellar are 34.75"H x 24.75"W x 25"D.
Concerned about shipping as we have experienced damage with large heavy shipments in the past. The shipping was perfect and on time ( actually a couple of days early)! Driver was great, placed in garage and allowed me to inspect. Surprisely ZERO damage to box and chiller was in showroom condition. The chiller zone controls are easy to set and quiet operation. Drawers are basically flat with small rubber ridges which simples arranging your bottles. Drawers take a little effort to open guessing due to self closing feature. Overall very pleased!! This is a nice looking wine cooler but makes a lot of noise ( audible sound). The temperatures flactuate often despite the door closed. First one was 10 years ago. Just as good now, even better. Would you like to purchase an Extended Protection Plan? This Plan covers products purchased as new or factory refurbished and manufactured for use in the United States, which at the time of purchase included a manufacturer's original or factory-refurbished warranty valid in the United States. In order to be eligible for a Plan, the manufacturer's original or factory-refurbished warranty must provide at least 90 days parts and labor coverage. This Plan provides for the repair or replacement of your product to its standard operating condition if the product fails to perform its intended functions due to normal wear and tear or a defect in either materials or workmanship, or unless otherwise stated in the Exclusions from Coverage section of this document. There is no deductible under this Plan. Please keep this document in a safe place along with the sales receipt you received when you purchased your product. The sales receipt may be required at the time of service. It will serve as a valuable reference guide and will help you determine what is covered by the Plan. As the Administrator, Wine Enthusiast will assist you in understanding your warranty and Plan benefits from the day you purchased your Plan. This Protection Plan does not cover shipping costs of replacement units should a defective unit require replacement. This Plan is based upon the term of coverage, product description and retail price limitations shown on your order confirmation email. This Plan will furnish replacement parts and/or labor necessary to restore your covered product to standard manufacturer's operating condition. If service is required because of a product failure during normal usage, the Administrator has the option to repair the defective product or replace it with a product of equal or similar features and functionality, though not necessarily the same brand. A replacement part or product may be new or refurbished. Technological advances may result in a replacement product with a lower selling price than the original product. No refunds will be made based on the replacement product cost difference. The most we will pay on any single repair to your covered product or its replacement is the price you paid for the original product, excluding taxes. If we replace the covered product in its entirety, our maximum liability has been met under this contract and there will no longer be coverage under the terms of this contract. Replacement products will include a manufacturer's warranty of up to 1 year and the retailer has the option to offer an additional extended service contract on the replacement product. If the covered product is not repairable and a replacement product is not available, we will refund up to the product purchase price, excluding taxes, and this contract will be fulfilled and all obligations satisfied. Should repair parts become unavailable because a manufacturer has gone out of business, if a manufacturer no longer provides product support or all parts sources have been exhausted during the coverage period of this Plan, the Obligor and the Administrator shall be excused from performance hereunder and you shall receive a merchandise coupon for the value of the purchase price paid by you for the Plan less claims paid, if any. Replacement products may be new or rebuilt products. In no event shall the Obligor or Administrator be liable for any damages as a result of the unavailability of repair parts. In no event shall the obligation to administer claims extend beyond the term of coverage commencing upon the date of product purchase. You may be required to ship or deliver the defective product at your expense prior to receiving reimbursement or a replacement product. The Administrator owns all parts removed from repaired products or complete units replaced in their entirety. If it is determined the problem is not covered under the terms of the Plan or there is a "no problem found" diagnosis, you will be responsible for any related charges to the service center. No Lemon Guarantee - If we have completed two service repairs for the same problem on an individual product or component, which first began after the manufacturer's warranty term had expired, and if the product or component requires a third repair for the identical problem as determined by us, we reserve the right to replace the product with one of like kind and quality, not to exceed the original retail purchase price excluding shipping, handling, and taxes. Once a covered product is replaced, then this contract is considered fulfilled and coverage ends. Preventative maintenance checks, cleaning, product diagnosis, customer education, accessory repairs/replacements, computer software related problems, and any unauthorized repairs done outside of the USA are not considered repairs for the purposes of this Replacement Guarantee. On-site: If your product needs repair, call 800.648.6058 to arrange service. An adult of legal age must be present at the location where on-site service will occur. If you live beyond a 25-mile radius of an authorized service center, you may be required to pay additional trip charges required over the 25-mile radius. While most products can be repaired on-site, some products, due to their sensitive, technical nature, require the controlled environment of a factory authorized service center; therefore, on-site repair is not possible. This Plan does not cover labor or materials to obtain access to covered components if structural modification or repair is required. It is your responsibility to ensure that the covered product is accessible to the service technician. If your covered product needs repair or replacement for mechanical or electrical failures, you are required to call 800.648.6058 to obtain authorization prior to having repairs made. For faster service, please have your dated proof of product purchase (sales receipt) available when you place the call. All repairs must be approved before they are performed. We will not reimburse you for repairs performed without prior approval or performed by unauthorized servicers or others. Do not return the covered product to Wine Enthusiast unless instructed to do so. service center. A copy of the proof of product purchase (sales receipt), and a brief written description of the problem must accompany the product. We will not be liable for freight charges or damage due to improper packaging. repair or replacement has been completed. If your product is covered under another valid service contract and/or insurance policy, this Plan will provide coverage over and above the other service contract and/or insurance policy. While we try to complete service as quick as possible, we are not responsible for delays caused by factors beyond our control, including but not limited to manufacturer's delays, shipment to a service facility or acts of God. If you transfer ownership of the covered product, this Plan may be transferred by sending to Wine Enthusiast, at the address above, the name, address, and phone number of the new owner within 10 days of the transfer. The cancellation provisions of the service contract apply only to the original purchaser of the service contract. This Contract, including the terms, conditions, limitations, exceptions and exclusions, and the sales receipt for your covered product, constitutes the entire agreement and no representation, promise or condition not contained herein shall modify these items, except as required by law. This Service Contract does not cover any loss, repairs or damage caused by or resulting from: pre-existing conditions incurred or known to you (pre-existing means a condition that within all reasonable mechanical probability relates to the mechanical fitness of your covered merchandise prior to contract issuance); improper packaging and/or transportation damage during shipment to a service center or relocation of the covered equipment; installation, removal, reinstallation or improper installation of components, upgrades, attachments or peripherals; damage or other equipment failure due to causes beyond our control such as environmental conditions, exposure to weather conditions or acts of nature including, but not limited to: fire, floods, smoke, sand, dirt, lightning, moisture, water damage of any kind, whether from fresh water, saltwater or other water intrusion, freezes, storms, wind or windstorm, hail, earthquake, etc. ; damage or failure caused by riot, nuclear radiation, war or hostile action, radioactive contamination, etc. ; battery failure or leakage; collision with another object, collapse, explosion, liquid spillage of any kind by any owner, employee, third party, repair personnel, etc., unless covered under a service plan which specifically includes any of the defined causes; interruption of gas or electrical service; neglect, negligence, misuse, abuse, intentional physical/mechanical/electronic damage or malicious mischief, theft or mysterious disappearance, vandalism, rust, corrosion, warping, bending, animal or insect infestation, etc. to the covered product or any component; accidental damage, including physical/mechanical/electronic damage cause by dropping; damage, warping, bending or rusting of any kind to the housing, cabinetry, outside casing or frame of the product or any non-operating part, including but not limited to plastic, or decorative parts such as hinges, knobs, door liners, glass, handles, masks, rack rollers, shelves, etc. ; loss of or repair to any components within the product not originally covered by the manufacturer's warranty or are considered expendable or consumer replaceable items and are designed to be consumed during the life of the covered product such as but not limited to, lamps, bulbs, tubes, filters, lint screens, external hoses, baskets or buckets, cords, wiring, cables, fuses, keypads, switches, connectors, batteries, belts, drums, developer, or any other parts or materials which are designed to be consumed during the life of the covered product; loss of wine; improper installation of customer replaceable components, modules, parts or peripherals and/or installation of incorrect parts; failure to product attachments not provided by the manufacturer or included in the original sale; failure to reset timer after a lamp replacement; or exploding or dimming lamps; repairs for cosmetic damage or imperfections or to structural items when they do not impact operational performance of the covered product; non-failure problems including but not limited to noises, squeaks, etc. ; operational errors on the part of the consumer (e.g., as abnormal ice build-up in a refrigerator or freezer); removal, installation, reinstallation, unauthorized repairs, etc., of any internal component or covered product including but not limited to adjustments, manipulation or modifications made by anyone other than an authorized service technician; loss of power, improper use of electrical/power, power "brown-out", power overload or power surge unless covered as further defined in the Special Features section of this document; any resultant malfunction or damage of or to an operating part of the covered product from failure to provide manufacturer's recommended maintenance or operation/storage of the covered product in conditions outside manufacturer specifications or use of a covered product in such a manner as would void coverage under the manufacturer's warranty or that are used in a manner inconsistent with the design of the equipment or manufacturer instructions or specifications; normal periodic or preventative maintenance, user education, set up adjustments; cleanings or any repair covered by a manufacturer warranty or other insurance. Other exclusions include: covered products subject to a manufacturer recall or rework to repair design or component deficiencies, improper construction, manufacturer error, etc. regardless of the manufacturer's ability to pay for such repairs; unauthorized modifications and adjustments, alterations, manipulation or repair made by anyone other than an authorized service technician; covered products with removed or altered serial numbers; consequential damages or delay in rendering service under this contract, or loss of use or data during the period the covered product is at an authorized repair facility or otherwise awaiting parts. If your covered product experiences a failure or damage that is excluded from coverage under this Section or in the event of a repair incident wherein there is a "no problem found" diagnosis from the manufacturer or a manufacturer-authorized repair source, then you are responsible for all repair costs including shipping costs and/or the cost of on-site service. Under no circumstances shall Wine Enthusiast be liable for indirect, consequential, or incidental damages (including damages for lost profits, business interruption, loss of data, and the like), even if any party has been advised of the possibility of such damages. This Plan will not cover any defects that are subject to a manufacturer's program of reimbursement. This Plan is not a warranty or insurance policy; it is a Service Contract. This Service Contract is not intended to create or limit any implied warranties concerning your product, which may or may not exist under applicable law. OUR RIGHT TO RECOVER PAYMENT If you have a right to recover against another party for anything we have paid under the service contract, your rights shall become our rights. You shall do whatever is necessary to enable us to enforce these rights. We shall recover only the excess after you are fully compensated for your loss. This service contract provides a 30-day free look period from the purchase date of the service contract. You may cancel this service contract by informing Wine Enthusiast within 30 days of the purchase of the service contract and you will receive a 100% refund of the full purchase price of the service contract. The service contract is non-cancelable after 30 days from the date of contract purchase. For those states that do not permit non-cancellation of your service contract, the law of that state shall apply to residents requesting cancellation. If we cancel this service contract, we must provide you with a written notice at least 15 days prior to cancellation at your last known address, with the effective date for the cancellation and the reason for cancellation. Return of the premium is based upon 100% of the unearned pro-rata premium. These terms & conditions are available on our website at WineEnthusiast.com/protectionplan or call 800.648.6058 to have a copy mailed to you. 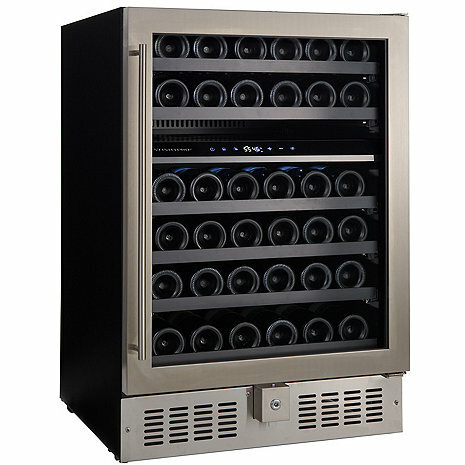 To order this configuration by phone, please call a Wine Enthusiast Wine Storage Consultant at 800.356.8466.